Apparently, about a month ago the Space Shot spotlights were reprogrammed. They are now doing a blended color change, where lights on two sides are one c0lor, and on the other two sides a different color. It seems to go through many more colors than it originally did when it was just cycling through primary colors. Around July 4th, it was just doing red, white and blue. According to a poster in my Facebook group, The Monster debuted a new lighting program recently. I saw it running on Saturday night and it caught my eye because some of the ground lights were flashing. It seems to stop the heartbeat read lights on the tower sooner, and does more things with the ground lights than the original program. I’m not quite sure I like it yet, but I expect it will grow on me as I see it more. That’s certainly a lot more going on. The programmers have certainly been learning more things they can do with the lights since the ride opened on June 4th. From the Wayback Machine, here is the small map they had on the website in 2000. The Wrangler was still in Outlaw Gulch. 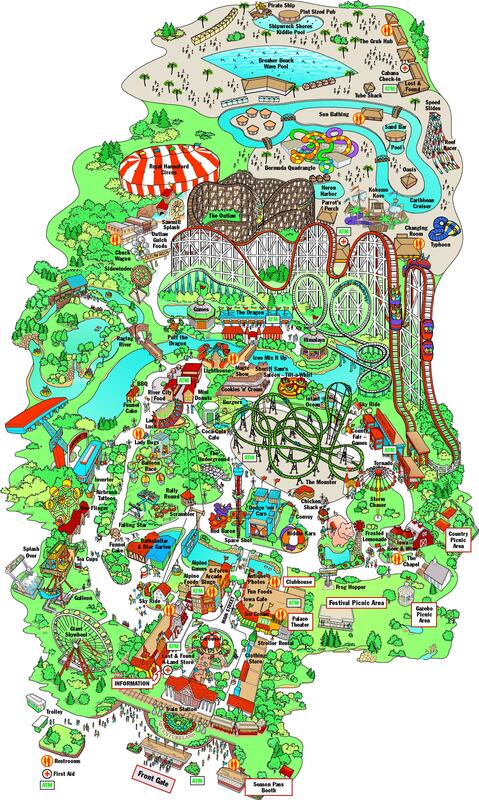 From the Wayback Machine, here is the small map they had on the website in 2002. The Wranger has been replaced by Saw Mill Splash. In 2016, The Monster opened, replacing River Rapids log ride. Cookies and Creme opened, replacing Football Toss. The Round Up was renamed to Tilt-A-Whirl on the map. In 2014, Storm Chaser opened, replacing Silly Silo. Iowa Beer and Wine Shop opens. In 2013, the Hole In One game in Last Frontier became Football Toss. At this time, the maps were PDF files on the website. I will post a JPG version of it at some point. In this map, the corner location in Last Frontier was still Hole In One.